Please help me welcome author Sherry Soule to A Buckeye Girl Reads! 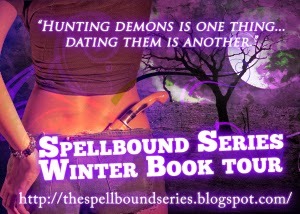 I'm happy to be a part of her Spellbound Series winter blog tour! 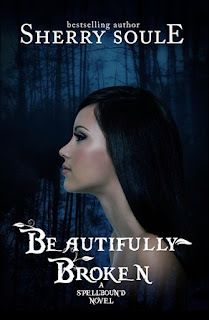 She is here today with an excerpt from Beautifully Broken! The newlyweds had snickered at the rumors that the mansion was haunted. Scoffed at the neighbors that insisted it had an infestation of ghosts. And shook their heads at the people who crossed the street rather than pass by their house. They had moved in despite the mansion’s apparent state of neglect. It had been vacant for so long that it had become dusty and forgotten. Craven Manor was a sizeable estate located in Fallen Oaks and built within what some referred to as the upper-class section of town. In her mind, the mansion was perfectly situated in a quiet, rural setting, yet close to the bustle and conveniences of the downtown area. Crickets sang and dragonflies buzzed the entrance. Grass grew wild and tall in the yard, sprouting through the cracks in the cement path leading to the portico. The monstrous Gothic mansion was vast and rambling and wilting. It consumed the sky and blotted out the sun. Harsh seasons had torn shingles off the roof. Windows were randomly boarded shut. The fog purled and thickened. Outwardly, the manor had a formidable appeal, constructed with a fusion of Gothic and Victorian architectural styles, which closely resembled the features of an American Carpenter Gothic design, often characterized by steep gables and pointed windows. The manor was bursting with cupolas and spires and scrolled balconies—everything except gargoyles. Towers, sculptural detail, and boldly angular masses were prolific across the exterior. It had black wrought-iron embellishments, storm shutters, and of course, the obligatory lightning rod atop the tallest tower that donned it as a stereotypical-looking haunted house. Determination flowed through her veins as Catarina tossed her long ebony hair over her shoulder. Placing hands on her slim hips, her sapphire eyes glinted with pride at the estate. No, her new home. The mansion’s walls were long and high and its towers peaked above the staggered trees. Gigantic and sprawling and unyielding. The wide front porch led down to a pebbled walkway flanked by low evergreen hedges and lush green grass. In the yard was a peculiar oak, ancient and ragged, like the ghastly white bones of an arthritic skeleton. It loomed like a sentinel positioned menacingly on a knoll as if to warn trespassers that this place was not to be entered whimsically or taken lightly. While Catarina was aware of the macabre appearance of her newly acquired treasure, she intentionally overlooked the oddness of it. All that was required was a little cheery paint, some pruning, and landscaping, which would rectify the gloomy, almost mournful tone of the unkempt estate. Besides, Catarina wasn’t the type of woman to spook easily, nor was she prone to an overactive imagination. With her husband Maxwell frequently gone on business trips, she’d have to endure the problems of running such a large household on her own. But she didn’t mind. She was an independent, sensible woman, and since she’d become the mistress of this Gothic estate, she refused to be disturbed by a few ghost stories. The logical part of Catarina’s brain knew it was just a house. Brick, glass, wood. But what she didn’t see was what lay beneath it. It was dangerous. Restless. Insidious. Yet Catarina refused to believe that real evil hid behind its beautiful façade. Even though she thought on the outside made the Amityville Horror seem tame in comparison. Running the tip of her tongue over her full lips, she straightened her spine. She marched forward, mounted the steps, and unlocked the door. A part of her wished that Maxwell could be here to explore the house with her, but she knew that his many businesses required him to visit many parts of the world. But she would keep herself busy decorating her new home and tending to the gardens. She wouldn’t have time to miss him and when he returned the house would be finished. Her first task was to explore the interior, and she found herself amazed at the ornate chandeliers and gold-framed mirrors. Walls of brocaded velvet, with hanging tapestries, and unpolished hardwood floors. At the top of the massive and baroquely carved mahogany staircase were eight luxuriously furnished bedrooms, three bathrooms, and a private office. In the parlor on the third floor, she swung open a corner cabinet door and found an interesting wooden trunk inside. Holding the chest gingerly in her hands, she placed it on the end table where she could open it. Catarina pried open the lid and discovered one lone item: an old iron skeleton key with an elaborately fashioned handle. She held the key up near the window to examine the object more closely in the little light yielded by the grime-covered window. “Hmmm, I wonder what this opens?” she asked herself as a jangling clatter pierced the quiet. The telephone. Following the direction of the ring, she descended the staircase to the second-floor. She spotted the phone resting on a hallway table near what she’d chosen as her bedroom. She hurried forward, tripping on a loose shoelace and almost falling. Finally, the phone screeched its last plea and fell silent just as Catarina placed her hand on the receiver. The screen on the caller ID reported it had come from an unknown caller. Too busy to care, she went down the next flight of steps to the main floor. Catarina decided to explore the grounds before sundown. In October, the air was prone to chill and night came early. She hunted around for the jacket she’d left on the bench near the front door and shoved her arms into the leather sleeves of the coat. She patted her pockets to make sure she had her keys, and located them in her right front pocket. She spun around. The corridor was dim and void of human life. On the wall, near the ceiling was a bloody handprint. She blinked and rubbed her eyes. Shrugging, she ignored the whisper and pulled the front door open. It was just her imagination. She told herself there was nothing to fear. She left the door unlocked, and marched onto the porch, then stepped down into a carpet of deep, soft green. Dirty windowpanes glistened in the sunlight. A humid scent like wet moss and freshly cut grass floated on the air. Catarina strolled in the gardens, noting the overgrowth of untended rosebushes planted beneath the stained-glass windows. She paused for a moment to survey the grounds. Ahead of her was a broad expanse of land—acres of lush grass that led to a thicket of trees that bordered the back of the property several hundred yards away. Even from this distance, she could sense the onset of winter, as most of the leaves of the staggering redwoods had fallen, leaving the branches bare like bony fingers reaching toward the ground. From this vantage point, the scale of the mansion impressed her. She was able to view most of the three-story structure and the colorful glass of the windows that embodied the second and third floors. Inside, the heavy drapes that lined the windows were evident as well as the gauzy fabric intended to filter light and add privacy. At the top of one peaked edge were three crescent-shaped windows that she guessed belonged to the attic. To the right of the property was a rundown gardener’s shed. She decided to check out the wooden shed and its contents before it became too dark. Nearing the shed, she stopped abruptly. “Catarina…” A whisper by her ear, faint and distant and close all at once caused her to freeze. Trembles traveled from her legs and vibrated up her neck. Dread choked her like a noose, strangling her from the inside. Once her feet became motionless, the crunching of the autumn leaves beneath them became silent, and she began to doubt that she’d actually heard anything at all. Then her eyes caught something else in the dying light. Ground fog swirled and transformed, rising higher, forming a distinct black shape in front of her. An apparition with bleak hollow eyes. She blinked until it disappeared. Then she took a deep breath, turned her gaze toward the horizon where the sun was making its slow descent, then turned her head to face the house again. She gasped. In an upstairs bedroom, someone parted the drapes and a translucent face stared down at her from the window. A prickling sensation glided over her body before settling in her stomach. Bile rose in her throat. Catarina struggled to calm herself; all she had to do was call the police and report an intruder. Instead, Catarina scanned each vacant pane, and then she turned completely around and stared at the road in front of Craven Manor. Not a single car or person in sight. Nothing hovering human-like in the fog. She shook her head, turned back around, and closed the gap between her present position and the entrance to the shed. The door was made of two out-swinging panels, intended to allow enough room for gardening implements to pass through. The panels were held shut by an old, rusty lock. She reached in her pocket for the keys. All she found was a bit of lint. Catarina tried the other side. Vacant. Perplexed, her mind raced back to the moment when she’d dropped the keys in her pocket before leaving the house. She searched the pockets of her jeans. “Huh. I must’ve dropped them on my way out,” she said and began retracing her steps across the yard. She passed the oak, reticent and massive, on her way to the porch. The setting sun cast long shadows on the ground. Catarina mounted the steps and opened the front door. Her fingers groped the wall near the entrance feeling for the light switch. Even in the late afternoon, the rooms were dark and eerie. She shuddered as a cold draft swept through the door, sending fingers of cold running over her skin. Her gaze flicked outside, through the open door. Steeped in shadow, darkness echoed and folded inside itself until sunlight was absorbed completely, and the trees surrounding the mansion were bent and stooped, pouring more shadows across the hallows of what used to be the most prestigious house in Fallen Oaks. She flinched. The autumn wind was howling. Flipping the switch up and down frantically, the room remained immersed in darkness. Her heart thudded loudly in the quiet. Finally, the overhead light flickered to life. The chandelier light was dim, but adequate enough for Catarina to spot her keys. Relieved, she lifted the misplaced keys from the hallway table. But her relief was fleeting. Her heart pounded. Her hands shook. No answer. But Catarina knew she was not alone. She had to write this down. Keep a record. I know! I’ll write to my sister. She began to back slowly toward the front door. They say every town has its secrets, but that doesn't even begin to describe Fallen Oaks. The townsfolk are a superstitious lot and the mystical disappearance of a local teen has everyone murmuring about a centuries old witch’s curse.